These easy bacon deviled eggs are a classic recipe dressed up with the addition of bacon bits and chives. Plus learn my tricks for the best deviled eggs ever! Rich and creamy deviled eggs with bacon are a simple yet satisfying appetizer that everyone will love. 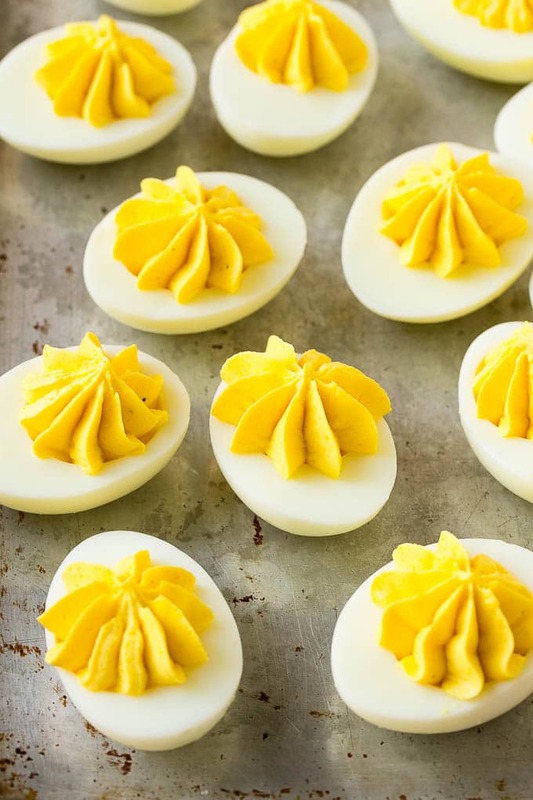 I used to be intimidated by making deviled eggs, but now I’ve got some tips and tricks up my sleeve to make sure my deviled eggs come out perfect every time. Serve your deviled eggs along with other party favorites such as sausage balls and caprese skewers! I’m going to be honest and tell you that for the longest time, deviled eggs scared me. How could I possibly boil a bunch of eggs, peel them neatly, and add the filling in the middle without it looking like my 4 year old did it? Over time I’ve come up with ways to make sure these bacon deviled eggs come out perfect every time. No one can resist the combination of bacon and eggs, especially in appetizer form! 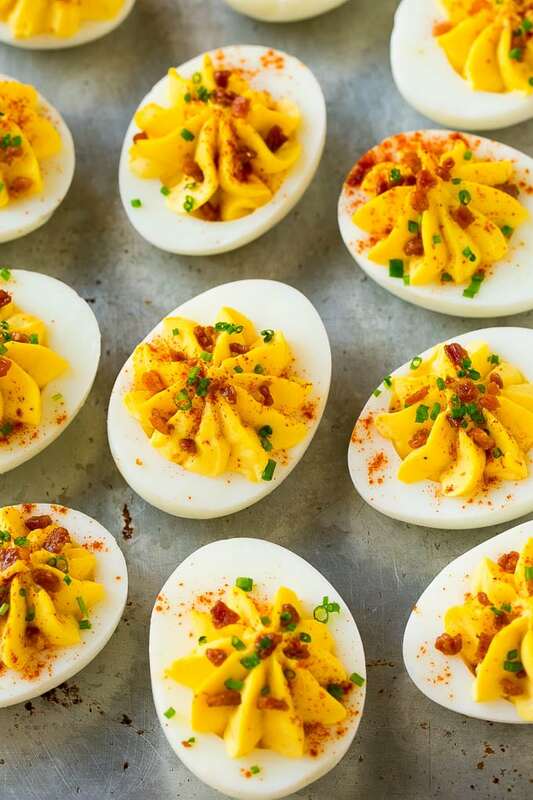 How do you make bacon deviled eggs? The first step to this recipe is to boil the eggs. I typically do this a day in advance to save time on party day. The whites and yolks are separated, then the yolks get seasoned and pureed to creamy perfection. The yolk mixture is piped back into the eggs, then topped with bacon and chives. These are the best deviled eggs that I’ve ever had, and they always get rave reviews! The most crucial component to perfect deviled eggs is to have perfectly boiled eggs to start with. 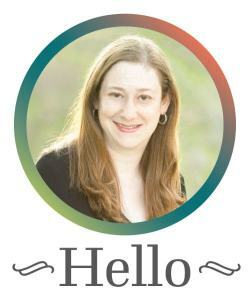 I use this technique from the Pioneer Woman and it’s always worked great! Also, I cook a few more eggs than necessary so if I have any issues with peeling, I’ve got some backups. The easiest way to fill a deviled egg is with a pastry bag. I use a disposable pastry bag with a large star tip for perfect looking egg filling. If you don’t have a pastry bag, simply use a gallon sized plastic bag with one corner snipped off as a makeshift pastry bag. For the best deviled egg filling, use a food processor to puree everything to a silky smooth consistency. 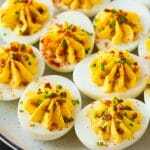 There are so many different ways to flavor deviled eggs, I love to mix up the recipe depending on my mood and the ingredients I have on hand. Pickles: Add 2 tablespoons finely chopped pickles or pickle relish to the filling. Prosciutto: Use crispy prosciutto bits instead of bacon. Dill: Swap out the dill for chives. Spicy: Add a few teaspoons of sriracha to the filling. Cheese: Add 1/4 cup finely grated cheddar cheese to the filling. 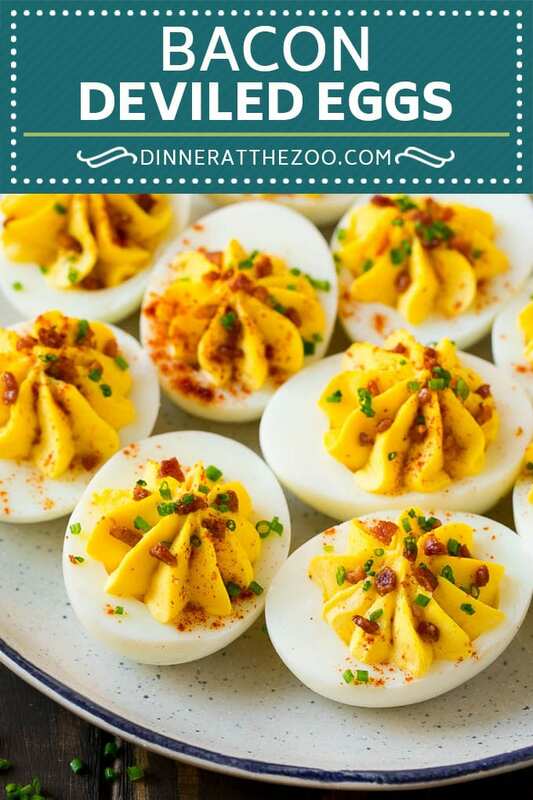 Deviled eggs are one of those traditional recipes that are universally loved, and when you add bacon to the mix you end up with a snack that’s sure to be a huge hit! These eggs can be made up to 1 day before you plan to serve them. If you’re making your eggs in advance, add the bacon right before serving. Do you have any tips and tricks for perfect deviled eggs? Leave them in the comments below! Separate the egg whites from the yolks. 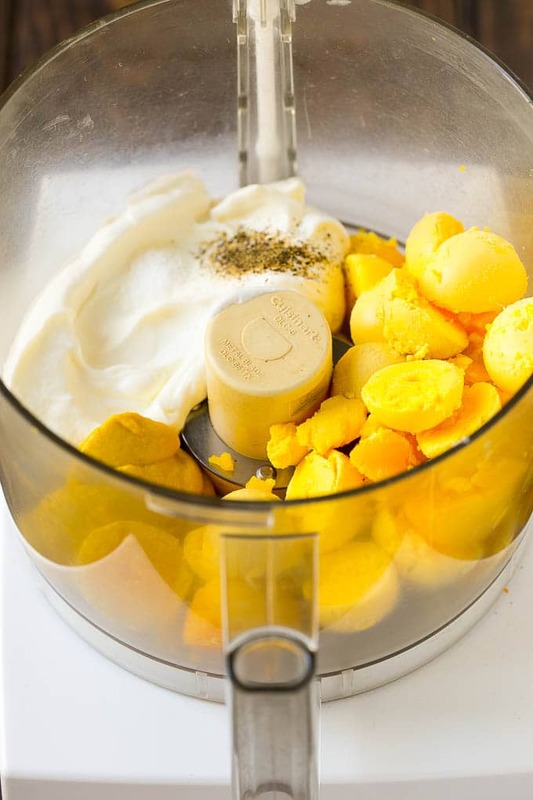 Place the yolks in the bowl of a food processor and place the whites on a serving tray. Add the mayonnaise, heavy cream, mustard and salt and pepper to the food processor; process until smooth. Place the egg yolk mixture in a piping bag fitted with a large star tip. Pipe the filling into the cavity of each white. Sprinkle smoked paprika over the eggs. Top with bacon and chives and serve. 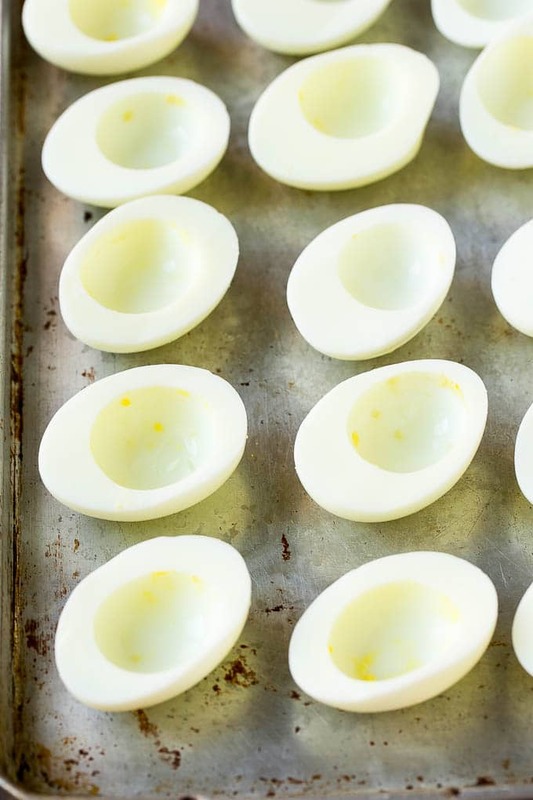 Try this technique for perfectly boiled eggs that are easy to peel. Don't have a piping bag? Use a gallon sized freezer bag with one corner snipped off. Keep your bacon crumbles small so that they'll stick to the filling better. This post was originally published on December 28, 2017 and was updated on February 10, 2019 with new content. Yum! Thank you for sharing. I have many friends and family members who would love these. Will have to save the recipe for our next gathering. Bacon deviled eggs are my fave! I hope I can do your recipe and share it with my family. So yummy! Bacon makes everything better. I mean, deviled eggs are already amazing but, bacon makes them even better. Deviled eggs are my weakness- anytime I see anyone makes it at party or it’s on a menu I must have! I’ll have to make the bacon version for my son and daugther. – since I don’t eat pork. However this recipe look phenomenal! Your deviled eggs look so pretty! 😀 I haven’t made them for ages and I have to say that they usually look like a kid prepared them 😀 Have to keep in mind your tips and give them another try. Eggs are my favourite for years and can’t do without them.This dish is easy to make & looks awesome. I always have problems peeling eggshells. I am going to use your advice the next time I cook hard boiled eggs. Thank you for sharing. We love deviled eggs at our house. We have a full proof way of making sure the eggs are cooked enough. I love the addition of bacon. Just when I thought I could not love deviled eggs any more than I already do, you add bacon into the mix. These would be a hit with our entire family for sure. Yum! Yum! Everything is better with bacon! 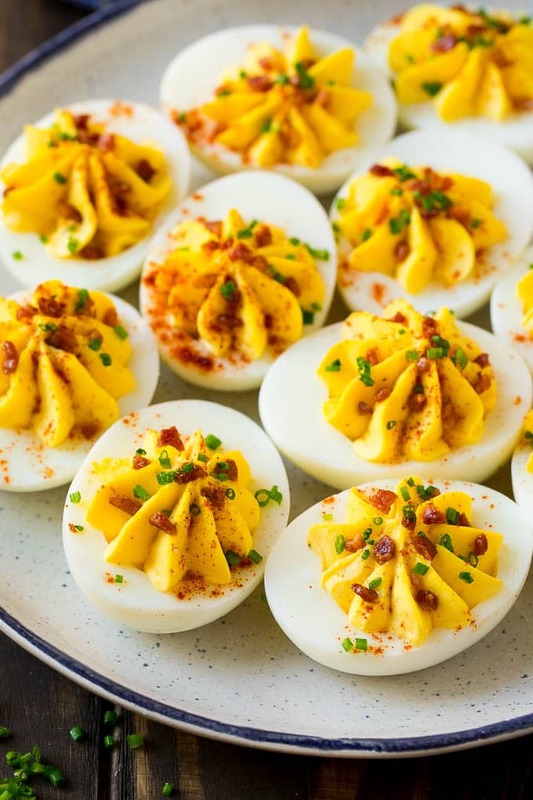 Deviled eggs are definitely one of the best party foods!